Welcome to the first day of Lawn Fawn's September inspiration week! 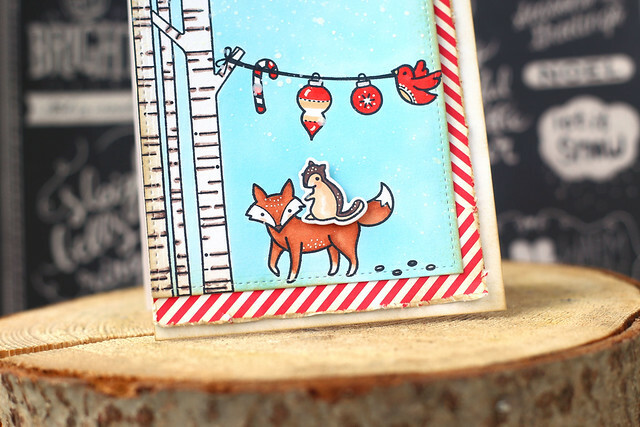 Today is our showcase of Joy to the Woods, and its coordinating set of dies. I think this card has a bit of a folksy feel, don't you? The artwork is a bit less cutesy than we're used to seeing from lawn fawn, too. I really love this set, and all the things you can do with it! I let the chipmunk have a ride on the fox's back as they checked out the ornaments that the bird was holding up. After coloring the images, including the entire background, I masked only some of the images before spraying a blizzard, (mister huey's opaque white spray) then went around accenting the images with a white gel pen. I felt like this worked well with the folksy feel of the card. Behind the images, I tried my best to line up 2 scraps of striped red paper (from last year's lawn fawn christmas collection) so that it looked like the stripes were going in opposite directions. Check out the lawn fawn blog for more Joy to the Woods inspiration - click! 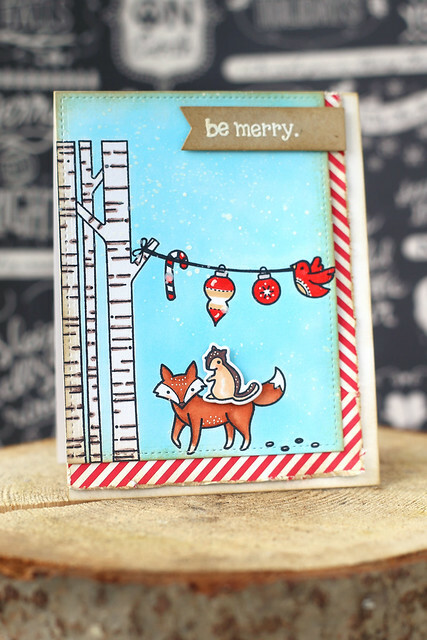 Very sweet Christmas card...love your white gel accents. So sweet! 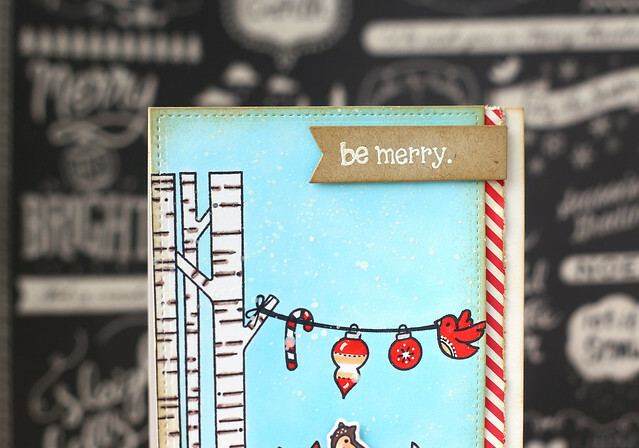 Love the bird holding up the banner and the little white gel accents you add to the critters! Oh, this is so sweet -- I love it! I really like how you placed the panel and your joined striped paper! Your card is absolutely adorable! I love how the ornaments and candy cane are hanging off the little wire. Super cute! I love his stamp/die set and you have created a wonderful card with it. Your idea of using the opaque white spray is great! I have snowfall stencils and stamps, but the spray gives it a more random look that I love. Thank you for the idea! I love the distressing on this card! The color combination is stunning!